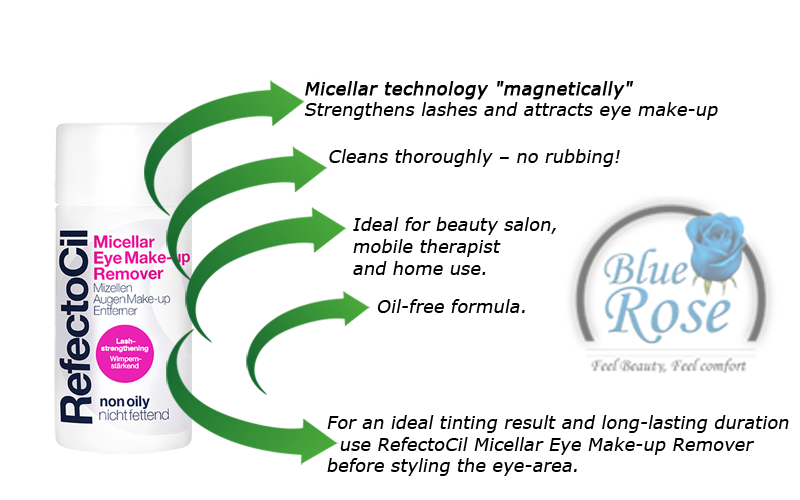 Refectocil Eye Makeup Remover - Strengthens lashes and attracts eye make-up thanks to micellar technology "magnetically". It cleans thoroughly – no rubbing! For an ideal tinting result and long-lasting duration use RefectoCil Micellar Eye Make-up Remover before styling the eye-area. Oil-free formula. Refectocil Eye Makeup Remover - Strengthens lashes and attracts eye make-up thanks to micellar technology "magnetically". It cleans thoroughly – no rubbing! For an ideal tinting result and long-lasting duration use RefectoCil Micellar Eye Make-up Remover before styling the eye-area. Oil-free formula. Use our lash strengthening Micellar Eye Make-up Remover also on clients not wearing any make-up to remove skin lipids and ensure an optimum tinting result.